Sterling silver eagle design stamped with cones dangling. It measures approximately 3" long including sterling silver french wires by just under 1 1/4" wide. It is Navajo hand made by Joelias Draper. Also available with blossom dangles. 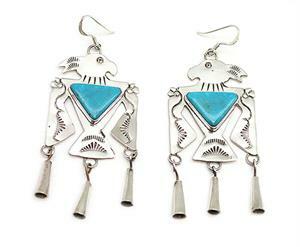 Turquoise stone may vary in color shade. Choose cones or blossoms when ordering.